...and share your data with the science community. 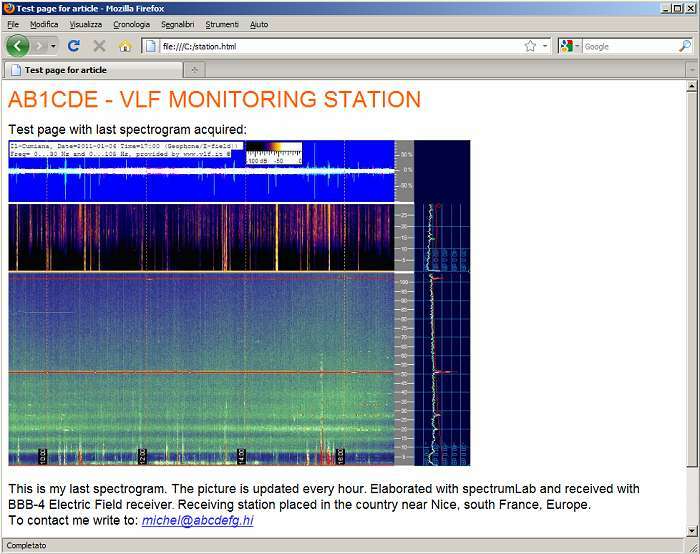 If you have created your VLF observatory and it works regularly acquiring data on VLF activity, it is natural that you may wish to share the data with other researchers. Who knows how many times we went on the web page of a university, and we looked at the data acquired from their systems. 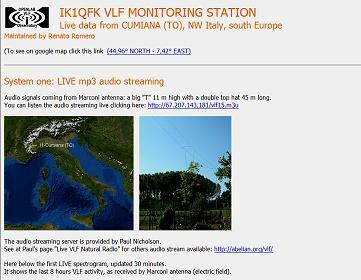 In this article we see how to build our own local VLF acquiring station as a “Web Observatory” with data on line. It sounds difficult, but, it’s actually quite easy! A high speed Internet connection is essential: it will need to transmit the audio stream and also the spectrograms on-line in real time. It can be used to connect to your PC remotely if you notice that something is not working and you are not home. Fortunately, you don’t need big numbers: 560 kb download and 125 kb upload speed are enough. These are common features of any basic ADSL. The type of commercial contract should be FLAT with unlimited traffic. The output audio stream will use the resources of your line 24 hours a day: same as a file sharing software like emule. Your provider should not oppose this. Finally: an ADSL with a dynamic IP is fine; we do not need a more expensive fixed IP. To have an ADSL line you need to create an account subscription with an internet provider. Please ensure that web space is also included with your subscription. To activate the observatory on-line does not require much space: the Cumiana observatory page contains a lot of data but occupies only 0.75 MB of web space. Most providers, with a subscription on-line offer free web space of 50 Mb, which is sufficient to publish more than 70 VLF Online Observatories, ...but I'm sure you will stop before that. The web space must be accessible by a FTP procedure. Some providers offer the opportunity to update their page only through a web interface (via web browser through the pages of a web site): for the observatory on-line that is not enough, you need to have an FTP access. The spectrograms saved in our database are not suitable for publication on the web. They always have a different name that identifies them. To publish the image on the web it must always have the same name. You must add this scheduling to Spectrum Lab: it must be instructed to periodically save a picture with the same name, in addition to those already stored in the archive. For this operation, the command can be entered as “Periodic Action” or as “Scheduled Actions”. The commands “capture” and “plot.capture” save respectively as a picture the spectrogram and the plotting, always with the same name, this is indicated: (“name of the file”). With this schedule at every hour the old images are overwritten by new ones. The two images with the same name always show the current situation. In the example every 60 minutes are two saved pictures: last-geomar.jpg and last-plotted.jpg. They are saved in the “Spectrum” folder, corresponding to the SpectrumLab session that created them. When opened it looks like a web browser (it is the renewed version of the old Netscape Communicator). Select “Composer” in the menu bar list and click on it. A white page opens. Use it exactly as you use Microsoft Word or OpenOffice Writer. Use it to compose your web page, but first of all save the page with a simple name like station.html on the primary route of your hard disk C:\. Now you have your local web page. If SpectrumLab is running as explained, opening this page you always see the last spectrogram of your observatory. Several sessions may be open in SpectrumLab, and many pictures of spectrograms may be included on the web page you just created. To do this it is necessary that every image on the web page contains the correct address with the SpectrumLab folder that contains it: if there is more than one session of SL installed on the PC, they will have different names, such as Spectrum1, Spectrum2, Spectrum3 ... etc. Your new webpage can also contain other files, in addition to the spectrograms, such as a photo of the station or the antennas. To do this simply create in the root C: \ a folder named "images", and insert images to put on the page inside. With the "composer" do the same operation described above with the pictures of spectrograms, this time referring to the Folder; "images". Html file saved with "composer" has no images, but only the reference where they are. If you must transfer them to your new webpage (for example in a USB key) it is therefore important not only to move the html files but also folders containing images of the page. This is important when we want to make our page available to Internet users. We will have to transfer “all the work done” to a remote server, given by our service provider, through a process called FTP. Do not forget anything: html file with structure folders and pictures, otherwise the page view from the Internet may be missing some components. It is all installed on our local PC and only we can see it. But it is an exact copy of what we want to make visible from outside. Now you only need to transfer all this to the web, and synchronize files periodically. Let's see how it’s done.how it’s done. Enter the FTP connection data: server name, user-id, password and port (usually # 21) and click on quick connect. The program connects you with the remote server. When you are connected, copy the contents of the left part corresponding to the files you edited on your PC first, in the right side corresponding to the remote server. Transferring files is easy, just like the Windows File Manager, by drag and drop. 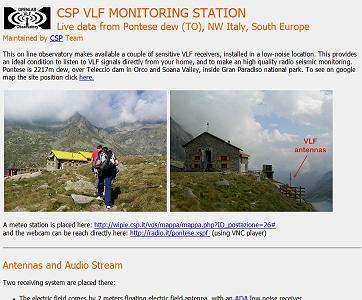 If you did a good job, even your pictures are visible, and your monitoring station is visible to the world. Now you can tell your friends. But the page is static and the spectrograms are not updated automatically. Every hour we should start FileZilla and copy images from your PC to the remote server. Obviously this is not possible. We need another piece of software that maintains the synchronized "last" type images saved by Spectrum Lab on your PC with the remote server. Here we go. It comes in two versions. The free version has some limitations: the number of Files in a Sync Job after trial period is 100 or less and the number of Sync Jobs after trial period becomes 3 or less (they are unlimited in Pro Version). The Free version requirements are enough for our work. And last we must define filters and timing. The filters are needed: they must avoid copying the entire contents of the “Spectrum” folder on the FTP server. We just have to copy one or two images. Now your software synchronization knows what to do. The images that SpectrumLab saves every hour will be transferred to the remote server and will be visible on the web. Your observatory is on line! The appetite grows by eating and soon your monitoring station will provide many signals to keep GoodSync busy. GoodSync is not the only program available for this operation. Other free software may be used such as SyncBack or AllSync. But the operating conditions are very similar. We have now seen how to put a monitoring station online. This information suggests some ways to do this. It is not a fixed rule: there are many ways to get the same results. But if you've never done it before... this will be of great help. I know what you're thinking: I wonder if it is very difficult to create an online audio stream? But that's another story.